COMPANY PROFILE HSBC Holdings PLC provides commercial banking, global banking, and wealth management among other services. It operates in Europe, Asia, the Middle East and North Africa, and North America. 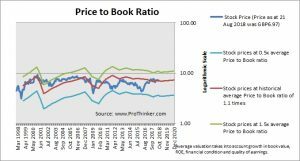 At the price of GBP6.97 as at 21 Aug 2018, Hsbc Holdings Plc is trading at a Price to Book Ratio of 1.1 times current book value. This is a 5% discount to its historical average Price to Book Ratio of 1.1 times.